This book of poems written by a Caribbean writer Israfil Sahibdeen, is based on personal physical experiences as well as the experiences of close friends, although a few poems are based on spirituality. Jesus Call Us Again&#x201d;, We Are One&#x201d; just to name a few. The poem &#x201c;Abortion Satan&#x2019;s Way&#x201d; Women have the right to make decisions about their own bodies. Fetuses, prior to viability, do not have the rights, until it is old enough to have rights of its own. Luke: 1, 41-44 &#x201c; If a baby dies before it is born- as in an abortion &#x2013; the woman who conceived it is still a Mother&#x201d; The poem &#x201c;Peace&#x201d; Peace starts with the individual. The mission of peace is to inspire and empower people around the world to be more at peace with themselves and others. Many lives have been lost in the name of peace. The poems found in this book makes good reading, and can be an inspiration not only for poets but for those in the area of literature. Israfil Sahibdeen also known as Mickey, (nick name) was born in Thick Village, Siparia Old Road, Fyzabad, South Trinidad. Presently Israfil lives at Recreation Ground Road, D&#x2019;Adadie,, Trinidad. His early childhood days he attended the PKA Hindu school, CM school and then went on to Southern Polytechnic College. Israfil left college in From 2 and went on to learn trade at San- Fernando Technical Institute and J.S. Donaldson Technical Institute and was employed in many disciplines such as a senior mechanic, instrument technician, electrician .... Israfil who is married an has two children and grand son Zjonathan, who also love poems. Israfil, who always have a love for poetry from a very early age and wrote his first poem in 1963- &#x201c;Put Something Away&#x201d; , since then, Israfil never stop and continued to write many more poems which you will find between the pages of this book.. Israfil who loves reading poems by George Herbert, Andrew Marvell, Rudyard Kipling, Rabindranath Tagore, and Toris Okotie . 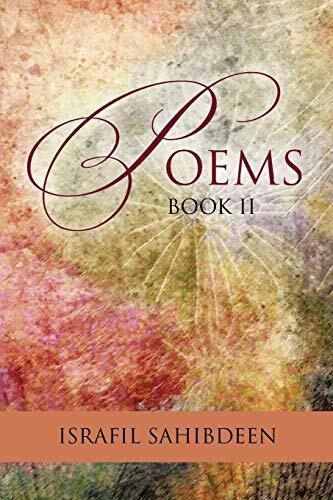 This book of poems is the first book to be published by Xlibris Publishing on behalf of the Author.